Plumbing systems work extremely well to keep sewage and wastewater where it belongs. But keeping that intricate system in-tact so we don’t end up with waste in all the wrong places requires a plumber with a high-level of skill and experience. With over 60 years of working on plumbing systems in Puyallup and the surrounding areas, John’s Plumbing & Pumps’s sewer line repair is the best choice for residential and commercial plumbing repair in Puyallup. A malfunctioning sewer pipe can spell swift and costly disaster for you or your business. And without a reliable, experienced plumber willing to go the extra mile to keep your plumbing system flowing as it should, the problem may only escalate. Why would the problem escalate? Some less dedicated plumbers take shortcuts when diagnosing faulty sewer lines. And if they don’t have video inspection equipment to pinpoint the exact problem, they may end up fixing the wrong problem. Worse yet, inexperienced plumbers could install a new section of pipe improperly, leading to contamination and sinkholes in your yard. The ease of performing daily activities takes a nosedive once those drains aren’t operating as they should. Suddenly, tasks you once took for granted like using the restroom, washing your hands, and cleaning up after a meal become impossibilities. And that makes for a serious inconvenience if you don’t have the money or resources to temporarily relocate. Our plumbers are available 24/7 to ensure that Puyallup homes and businesses are up-and-running at full capacity day and night. Calling our professionals means you reduce the time your daily activities are on hold, and when it comes to sanitation, that’s priceless. With 60 years of plumbing experience under our toolbelt, there isn’t much we haven’t seen. And, as with any trade, that means we’re able to arrive in a timely manner, diagnose the problem quickly, and perform the repairs faster and more precisely. It Doesn’t Smell Right – Sewage, as we all know, isn’t kind to the olfactory nerve. If there is a persistent odor, call us right away. We are available to take your call 24 hours a day. Slow Drains – It’s one thing if the bathroom drain needs cleaning once in a while to facilitate proper drainage, but it’s important to know the difference between a primary and secondary drain clog. Secondary drain clogs occur in pipes that are easy to access, like the ones under your bathroom sink. These can be cleared using fairly rudimentary methods like snaking or plunging. A clog in the primary drain cannot be accessed by anyone but a licensed plumber. Sinkholes – Soggy, sunken areas in your yard usually indicate a break in the sewer line. Again, this needs to be addressed by one of our professional plumbers right away to avoid the spread of disease and bacteria. 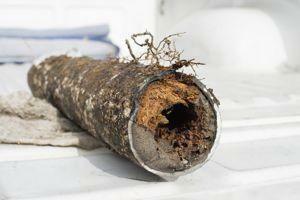 Know how to fix a broken sewer pipe? We do. For Puyallup and the surrounding areas, Call John’s Plumbing & Pumps, Inc.